The August edition of Tabletalk is out. 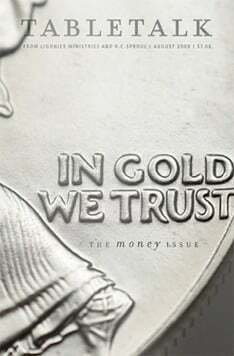 This month’s theme is “In Gold We Trust: The Money Issue.” It explores the necessity of practicing faithful stewardship of all our resources to the glory of God’s kingdom. Contributors include R.C. Sproul, David and Joshua Eby, James Harvey, Rosemary Jensen, Ken Jones, John Piper and David Wells. “Money from Nothing” by R.C. Sproul Jr.